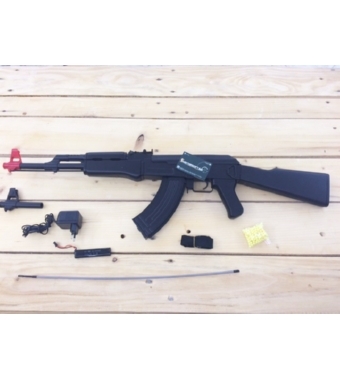 PRODOTTO DALLA CYMA, FUCILE ELETTRICO MODELLO AK 47 IN COLORAZIONE NERA. BATTERIA IN DOTAZIONE 7,2V-700mAh, CARICA BATTERIA INCLUSO. RIPRODUZIONE FEDELE ALL'ORIGINALE E MOLTO DIVERTENTE. HOP UP REGOLABILE, FUCILE ED INGRANAGGI INTERAMENTE IN ABS.